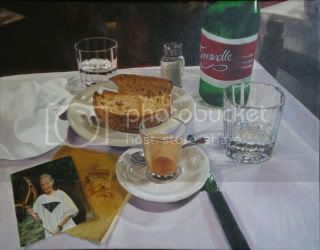 Trastevere, Espresso Finito was accepted for the Decatur Art Festival’s Fine Art juried show. It will hang in the Dalton Gallery, May 19-31. I need to get busy writing my artist’s statement for them. It will be a heartfelt one. This particular painting from my Table For One series commemorates a last meal at Trattoria da Lucia, across the Tiber in Trastevere, after I had knelt before a St. Francis in the church of Santa Maria and prayed for my daughter who was lost to be found.